A Louisiana sheriff's captain who released a combative video earlier this month that targeted alleged gang members, generated millions of views and was criticized by the American Civil Liberties Union resigned Monday. In a news conference, Clay Higgins told reporters that he was "not forced" to resign, but "rather, I've turned in my badge as a matter of conscience." Describing his work as a mission from God, Higgins said, "I will not kneel to violent street gangs. I will not kneel to murderers, or the parents that raised them. I will not kneel to a discredited wanna-be black activist that doesn't really have the best interest of his people in mind." It was unclear who he was referring to. In the original video, which was posted earlier this month, Higgins appeared on camera surrounded by law enforcement officers, some of whom were holding rifles. After identifying seven wanted members of a violent street gang who he described as "animals" and "heathens," Higgins said, "You will be hunted, you will be trapped, and if you raise a weapon to a man like me, we'll return fire with superior fire." Identifying one of the men by name, he said, "Darren Carter, you think men like these are afraid of an uneducated, 125-pound punk like you that's never won a fair fight in your life and holds your gun sideways? Men like us, son, we do dumbbell presses with weights bigger than you." @katlivezey - There must be a role this brave man can play within the Trump admin. Captain Clay Higgins should be considered a hero PERIOD! The video was posted on Feb. 17. Four days later, it had received 15 million views. 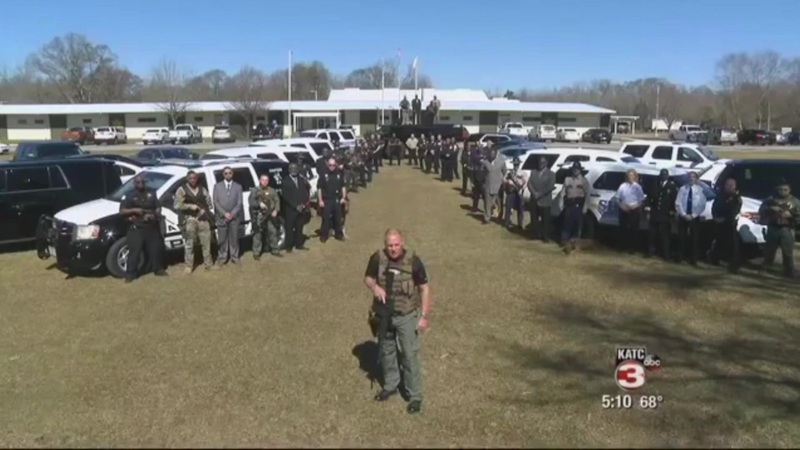 Higgins' boss, St. Landry Parish Sheriff Bobby Guidroz, weighed in shortly after, telling local media that the captain's Crime Stoppers video segments needed to be "reigned in," NBC affiliate KALB reported. The ACLU of Louisiana criticized Higgins' religious description of his work and said that the enforcement of laws — and the protection of rights — was where Higgins' job stopped. Captain Clay Higgins respectfully tenders his resignation to the Sheriff of St. Landry Parish Sheriff's Office. "Nothing that Mr. Higgins said will make his community safer, but there is much to suggest violations of fundamental rights of all," an ACLU statement said. In a statement Monday, Guidrioz said that he agreed "with the overall message" of the Feb. 17 video and that he was "not bowing down to political correctness." "My orders were to 'Tone down his unprofessional comments on our weekly Crime Stoppers messages,'" he said. "Secondly, I repeatedly told him to stop saying divisive, disrespectful or demeaning things like, 'You have no brain cells,' 'Knuckleheads,' or 'Liars.'" Guidroz added that Higgins appeared on the cover of local magazine in full dress uniform — a direct violation of department policy.